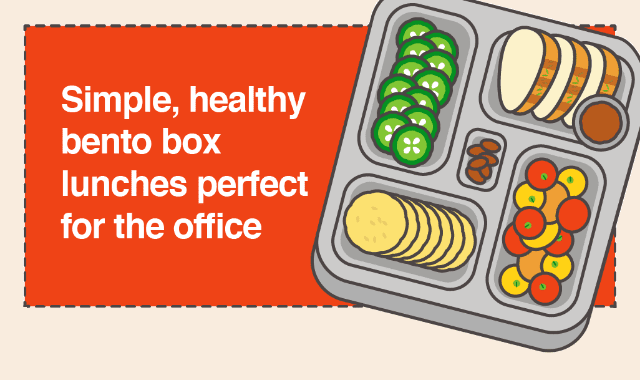 Simple, Healthy Bento Box Lunches Perfect For The Office #Infographic ~ Visualistan '+g+"
When it comes to lunch Monday through Friday, ordering out can get pricey—not to mention unhealthy. But it’s not always easy to come up with fresh, exciting lunches (sick of sandwiches and brown paper bags yet?). Enter: the bento box, a compartmentalized way to pack and serve creative lunches. The idea is to fill each small section with different fruits, vegetables, starches, proteins, and dessert (because what’s a meal without something sweet?). While traditional bento boxes often include cute foods shaped into animals, characters, and flowers, these fun lunches aren’t just for kids. Read on to learn more about the history of the bento box, tips for buying a bento lunch box, and what to include in each compartment.